​ ​​DFW – North Texas is one of the top regions in the country for home flips in first quarter 2018. The Metroplex ranked ninth among the metro areas with the most home purchases and quick resales in the three-month period, according to a new report by Attom Data Solutions​. More than 1,200 home flips were counted in the area—almost 8 percent of the total home purchases. The average DFW flipper made a gross profit of more than 22 percent when a house resold. DFW was the only Texas metro to make it onto Attom Data's top 20 flip markets list. 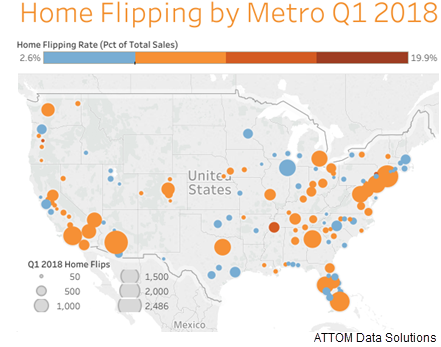 Phoenix, New York, Miami, and Los Angeles were also top flipping markets. ​See ​also: Dallas-Fort Worth-Arlington Housing Market Research​.